This is my personal invitation to all my readers to join me for Affiliate Meetup 2011. This is going to be an awesome event and I want to see you there! Here are the details. Sponsored by RevenueAds, Affiliate Meetup 2011 allows you to connect face to face with fellow affiliates as well as interested publishers and agencies. Enjoy an eventful day of interacting with other publishers, meeting the RevenueAds team, and learning about new marketing strategies. There’s also free food, refreshments, and even door prizes. I will be doing a presentation on industry trends and offer some very useful information that all affiliates will benefit from. There will be a catered lunch and you’ll get to enjoy drinks from RevenueAds’ well stocked bar. After the presentations, lunch, and prizes, we will head out to the Ford Center in Bricktown OKC. All in attendance has early access to the Oklahoma Thunder game to watch the players practice, do autographs and so forth. Then we’ll watch the game in the comfort of the RevenueAds suite. The suite will also have an open bar and there will be hors d’oeuvres served. The Best Part Is The Price: FREE! The best thing about Affiliate Meetup 2011 is the price. It’s zero! That’s right. 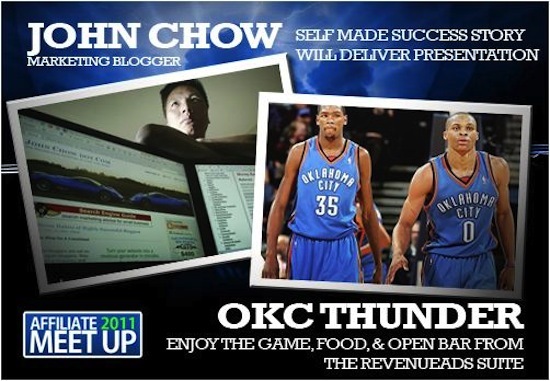 You get to come to Affiliate Meetup 2011, network with fellow affiliates, enjoy lunch, open bar and watch the OKC Thunder play the Charlotte Bobcats at the RevenueAds VIP suite, and it won’t cost you one cent! All you have to do is RSVP to Affiliate Meetup 2011 and you are in. If you live in Oklahoma, you would be crazy not to attend this event. Even if you’re out of town, you should seriously consider going. This is going to be a great time and I promise you will have a blast. I’ll see you at Affiliate Meetup 2011!